A significant portion of Mitchellville was shot on location in the Sea Islands of South Carolina, including at The Chapel of Ease (pictured above) and Penn Center. The Chapel of Ease is an 18th century church built of tabby, a cement made from lime, sand and ground oyster shells that is still found in West Africam. 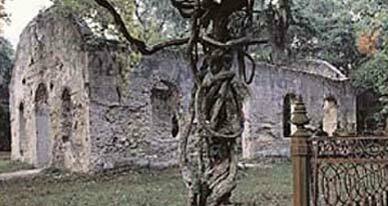 Penn Center was established as a school in 1962 to educate freed Sea Island slaves. The history of the Sea Island figures significantly in Mitchellville. In the early 19th century, St. Helena and Port Royal Island became the seats of large plantations that grew Sea-Island cotton. Needing labor, Sea Island planters petitioned the South Carolina legislature to reopen the slave trade, and as a result 40,000 Africans slaves were brought to the Islands between 1804 and 1808. The Sea Island slaves established a Creole language - Gullah- from English and African sources, which allowed the slaves to communicate with each other in a language not understood by their masters. During the Civil War, the Confederate Army established a number of garrisons on the Sea Islands. In October 29, 1861, a Union fleet of about 60 ships and 20,000 men attacked on the Confederate Forts Walker (on Hilton Head) and Beauregard (at Bay Point on St. Phillips Island) and the Confederate forces and white land owners fled, leaving 33,000 slaves behind. In April 1862, a military order was issued freeing the blacks in the Sea Islands, and soon thereafter General Sherman issued Special Field Order #15, which declared that the Sea Islands would be reserved for Freedmen. Under this order each family would be eligible for 40 acres of land and use of army mules no longer fit for army service. These acts would serve as the basis for the cry of "forty acres and a mule." By June of 1865 over 40,000 Freedmen had settled in the Sea Islands area, working over 400,000 acres of land. In the following decades, the freed slaves' land was taken back by whites. By the 1950s African Americans owned only 78,000 acres on the island. The situation got worse when a bridge was built linking the Sea Islands to the mainland. Developers soon came in, building gates and fences, cutting blacks off from fishing and hunting grounds and sometimes even traditional cemeteries. Today the Gullahs own only 1,000 acres on Hilton Head, tiny enclaves squeezed between golf courses and tennis courts.